Low power transformer with 50% Mumetal core for exceptional bandwidth and dynamic range. 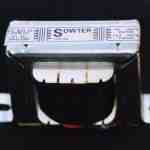 For use with triode etc. 10k ohms primary and 3 separate secondary windings configurable for 30 to 100, 100 to 250, 250 to 600 ohms headphones. 2.5 W at 50 Hz. Must be ac coupled to prevent dc in primary. Size "A" with colour coded leads or PCB pins. 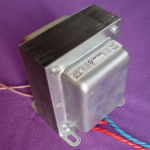 Low power Single Ended Output transformer for use with triode etc. 10k ohms primary and 4 separate secondary windings configurable for 600/300/150/40 ohms. 2W at 50 Hz. Up to 40 mA dc .Size "D" Fully shrouded package with colour coded leads. 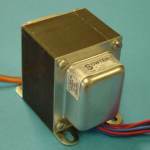 High power Single Ended Output transformer for use with triode etc. 2k ohms primary and 4 separate secondary windings configurable for 300/150/75/18 ohms. 10W at 50 Hz. Up to 80 mA dc .Size "M" Fully shrouded package with colour coded leads. 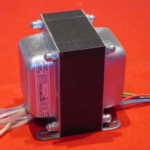 High power Single Ended Output transformer for use with triode etc. 8k4 ohms primary and 4 separate secondary windings configurable for 600/300/150/40 ohms. 10W at 50 Hz. Up to 30 mA dc .Size "J" Fully shrouded package with colour coded leads. 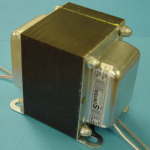 Low power Single Ended Output transformer for use with triode etc. 5k ohms primary and 4 separate secondary windings configurable for 600/300/150/40 ohms. 5W at 50 Hz. Up to 45 mA dc .Size "F" Fully shrouded package with colour coded leads.